OK, this wasn’t really a pre-planned N of 1 study. But it’s a case that illustrates the power of POCUS/EDE to help diagnose and drain peritonsillar abscesses (PTA). A male in his late teens presented to the ED a few months ago with a sore throat. He was seen in a walk-in clinic 2 days prior and placed on Clindamycin. As an aside he is known for an allergy to penicillin. His pain got worse so he came to the ED. He had a muffled voice and was unable to swallow fluids. VS were normal except for a mild tachycardia. His tonsil on the left was red and swollen but there was no exudate. He had some cervical lymphadenopathy. A PTA was visible on EDE. With static EDE guidance, the EP was able to drain 4 mL of pus from the tonsil. The patient felt better. He was started on IV antibiotics which were continued as an outpatient via home care. He was seen in follow-up a couple of days later. He was much better so he was converted p.o. antibiotics. A few months later, he developed another sore throat. It started the morning of ED presentation and was accompanied by chills. He had been treated 2 weeks prior for strep throat via a walk-in clinic. He improved but the symptoms recurred and worsened. Once again, his left tonsil was swollen, and red, and he had cervical lymphadenopathy on that side. On this occasion, exudate was present. A battery of blood tests were ordered including a Monospot. The WBCs were 17.9 and the Monospot was negative, with the other tests being unremarkable. No EDE was performed. The patient was admitted to hospital with diagnoses of pharyngitis and dehydration and was placed on IV antibiotics. After 2 days in hospital, he had improved somewhat and was allowed to go home on po antibiotics. An inpatient ENT consult was requested but never occurred. The patient returned to the ED on the same day that he was discharged from hospital. His pain and difficulty swallowing got worse yet again. The EP used EDE to diagnose a PTA. Five mL of pus was drained using static EDE guidance. The patient felt better. He was placed back on IV Clindamycin for 24 hours. At recheck, he was much improved and was converted to p.o. antibiotics. Follow-up with ENT was arranged for consideration of tonsillectomy. I don’t really need to add anything else. The case makes the point. Does the approach of admission with IV antibiotics sometimes work? Does the abscess sometimes drain spontaneously with this treatment? Sure. But would it not be nice to make the patient feel better sooner? And how about avoiding an unnecessary admission in some cases? It’s a “win-win” with EDE/POCUS. EDE turns this scary procedure into one that is see-one,do-one, teach-one. Just to underscore that point, none of the EPs who saw this patient would be considered POCUS experts. They have done EDE 1, EDE 2, and have obtained their CPOCUS IP status. That’s it. No images or video were submitted for this case, so here are some from the book and EDE 2. This illustration should be corrected for the next version of the book. The far-field wall of a PTA usually sits no more than 3 cm deep. The carotid is generally deeper, at about 5-6 cm of depth. If you have the luxury of 2 different brands of endocavitary probes, use the one with the smaller probe head. It is easier to get in the mouth in the presence of trismus. A squirt of nasal midazolam is an option if your patient is anxious. This black or “liquidy” abscess appears partway through this video. It points out a misnomer. 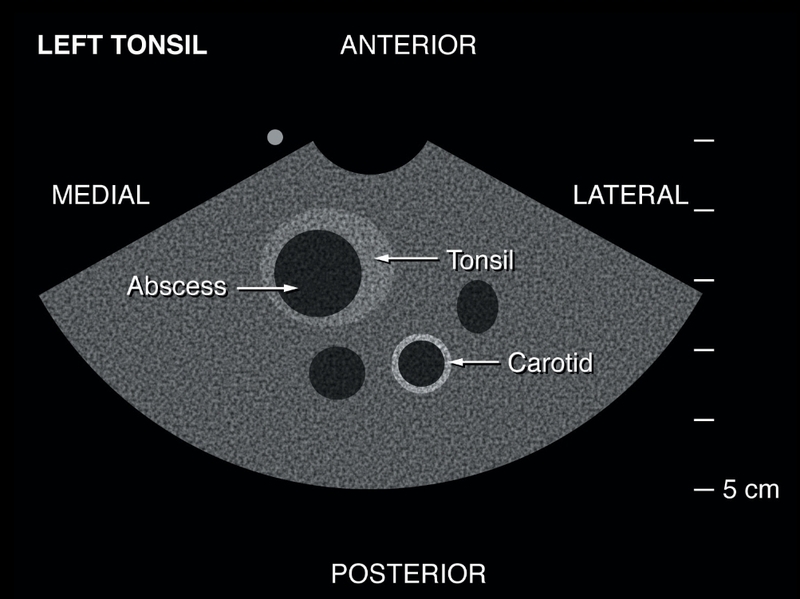 Most PTAs are within the tonsil and not beside the tonsil. So they are really intra-tonsillar and not peri-tonsillar.